When working with imported files, whether they are sent to us from a customer or we download from a vendor’s website, it is important that we make sure the file(s) have no errors that will hinder us from getting the rest of our project done. 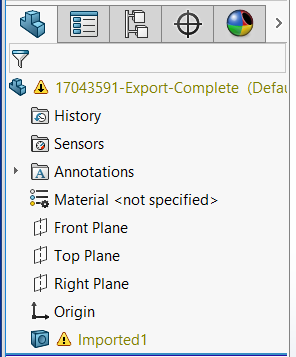 SOLIDWORKS give us a set of tools with Import Diagnostics that allows us to check out files to make sure there are no bad faces or edges. That same tool also has the ability to heal those same bad edges and faces. Tip: If your file took a long time to import you may want to say no and save your file before running Import Diagnostics. The Import Diagnostics tools gives you many different options to clean up you file. There are three main options: Heal All, Heal All Faces or Heal All gaps. 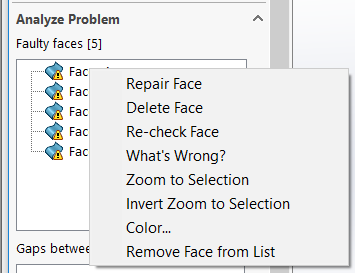 If there is a lot of Faces or Gaps to heal, you can always right click on one face to view the options related to just that particular error. Now, even if the file shows no errors it is important to run Import Diagnostics as some bad faces don’t show until you run the tool. File with errors on import, still had an error when running Import Diagnostics, Attempt to Heal All resolved all of the issues. File with errors on import, Attempt to Heal All resolved all of the issues. 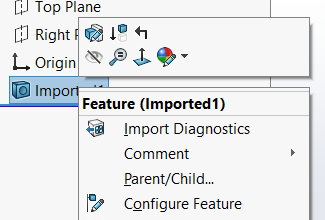 If you want to run the tool after the fact a simple Right Click on the Imported Feature will give you the option to run Import Diagnostics. 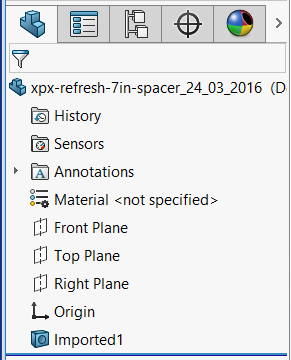 Note: If you add any additional features to your imported model you will not be able to get run the tool again, it can only be used on a file with just an imported feature. The last thing to remember is to know the limits of any tool you work with some files like the one below have so many errors that hitting Attempt to Heal All may be too much for your system to handle. When you have a file like this you will want to look at your other options, for more information on how to work on these files take a look at the following articles. I hope this helps in working with your imported files.